Lately, I’ve wanted to read some good Pakistani writing (the previous being The Death of Sheherzad) since most of modern Indian writing seems to be of the same genre (editing ancient works and presenting the same in a different way). So, I stumbled upon this book while randomly browsing in a bookstore and I found the synopsis to be quite interesting and also, till I saw the cover of this book, I had no idea that there was a film based on this. Anyway, this is the background as to how I picked up this book and I’d come to the review without any further digression. The story features Changez, a young Pakistani graduate from Princeton, who is narrating his experiences in US to an American stranger at a café in Lahore. The protagonist is from a well off family in Pakistan and gets into a well-paying job in a Wall Street firm. He falls in love with one of his college mates, Erica, and is also considered a high performer in his job. It looked like nothing could go wrong in his American dream and looked well set to assimilate into the American society, but just then, 9/11 happens, his lover goes mentally unstable over her dead ex-boyfriend and Changez is in full dilemma – he is part of the same society that is likely to invade his home any time. The best part about this book, in my opinion was the narration; it felt as though Changez was talking to me, the reader. It is literally narrated in the perspective that someone is actively talking to you and not like how they show in movies, where somebody starts an old story and it comes back to reality only when the story is over. Moreover, the protagonist’s dilemma was brought out very well, by the author where at one end, he is fully defending the American actions as to how the flaw of an innocent being persecuted can happen in any country and at the other end, he is unable to let go off the fact that people at home are worried that they could be invaded anytime. Moreover, I felt the balance was really good, between his professional life, personal life and also how the events unfolded after 9/11 and the 2001 Indian Parliament attack leading to the eventual stand-off between the two countries. Also, if you’re imaginative enough and you have an eye for finding imagery, you can find a lot in this like how the relationship between Erica and Changez could be seen like the shaky relationship between US and Pakistan, where, US does love Pakistan, for various reasons, but has its own expectations and won’t budge till it is satisfied (similar to how she expected him to be like her ex). There are several others apart from these in this novel and I don’t wish to spoil them in my review. However, my problem with this book is, there were two things that attracted me into buying this book, the first being the title and the second being the synopsis. Yes, I agree that he was reluctant and was caught in a dilemma but he was anything but a fundamentalist. In fact, he was highly secular and had actually fit into the American society perfectly and nobody would’ve noticed the difference if not for the colour of his skin and his name. 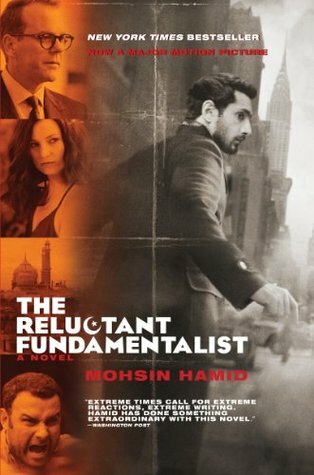 When I first read 'The Reluctant Fundamentalist', I expected someone with the personality of Maajid Nawaz but then, as aforementioned, Changez was altogether different. Moreover, the number of times the word ‘Muslim’ or ‘Islam’ is mentioned in the book I believe is countable with your ten fingers and thereby, the cover page with the crescent, yet again is very highly misleading. The second part is, that it talked about the betrayal by both, the West and the Western Woman whereas, if at all there was anything, he betrayed himself, owing to his dilemma and he already knew what he was getting into, when he got into the relationship, that despite the death of her boyfriend, she still loves him and eventually plunges into depression because of that – she never left him owing to some selfish pursuits. I agree that the latter is something the author could hardly be blamed for, giving the benefit of doubt that it is from the publisher, but the title, the author certainly is responsible. I liked the way the author ended the novel leaving it open ended and the reader can imagine it in anyway it suits them and yeah, Changez was a really lovable character so, I naturally assumed an ending suiting how I saw the characters in the novel but you, as a reader, can end it in any way you want to. Moreover, for someone from the larger side of the Radcliffe line, it would be interesting to notice how there is little difference between the two sides, how someone who goes abroad from either sides behave the same way, how both sides feel threatened at home by the other side and of course, the fact that the only difference between the two sides is in fact, just the Radcliffe line. While I would have really liked to give this book a better rating, I would have to say that the title deceived me too much and I’d stop with saying that it was a good story and give a standard rating of six.